The new EP, Eurydice, from the hard rock quartet Misty Eyed dropped today! We’re excited to share our thoughts on the tracks, along with an exclusive interview with the band in today’s Feature Friday. 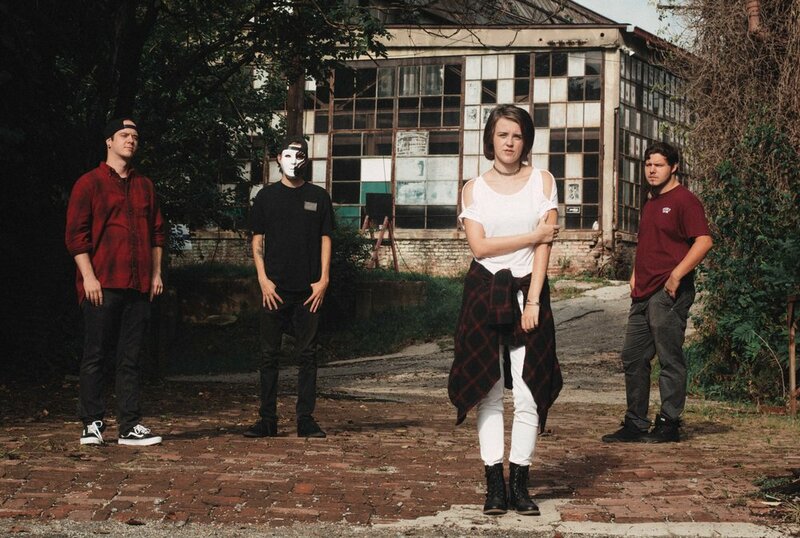 Having recently shared the stage with big name artists like Lamb of God and more local acts like The Funeral Portrait, ATL based Misty Eyed are busy laying a solid groundwork on which to build their career. The opening track, ”You’re Not Alone,” hits you with a soaring guitar solo pounding percussion. Clocking in at four and a half minutes, it’s the longest running song on the EP. The following track, “Attila,” was the EP’s single, and you can learn out thoughts on this track here. The stark line “Time will always take its toll” in “The Vibe” stands out as a cruel truth in what can often feel like a cruel world. “The Vibe” is a softer song with lyrics that reflect a rambling personal confession. Starting with the sound of a wailing siren and gentle rain, Eurydice swiftly moves into a mix of heavy riffs, intense bass and swift, strong drums on the closing track “You’re Not Alone.” The effortlessly clean and serene vocals of Megan Burke fall over the instrumentals, rising and falling as the track progresses. This is the only track that feature rough backing vocals paired with Burke’s crystal clear register. Eurydice showcases Misty Eyed’s overflowing energy. For future releases, it’s likely that Burke will further explore her range — her powerful vocals can command attention and convey deep emotion as shown through the heavy subject matter that the EP contains. While most genres are incredibly male-dominated, and it’s important for women and non-males to have visibility in the music world. As a young band, Misty Eyed have a bright future ahead of them. Continue reading below to check out an interview with the band where we talk about their new EP, future plans, and more! Q: At what point did you know that you had a clear vision for the EP, and what song was the most challenging to nail down during the writing process? Q: "Attila" has been out for close to a month at this point. What about the song solidified the decision to release it as a single? A: It was between “Attila” and “Not Coming Home,” but we figured the aggressiveness mixed with the catchiness and simplicity gave it the edge. Q: What has been the most rewarding opportunity that you've had as a band to date? A: The opportunity to play the Blue Ridge Rock Festival in Virginia. We were on the main stage with bands like Nonpoint, Lamb of God, Unearth, Puddle of Mud, etc. Q: What's the first album that you purchased, and what's the most recent album that you listened to? A: The first album Wes bought was Karma and Effect by Seether and Zach’s was Beyond Hell, Above Heaven by Volbeat. However, Megan’s last full album she listened to was Trench by Twenty One Pilots. Q: With 2018 coming to an end, what are your goals for the upcoming year? A: We have some new material we’re hoping to have finished for a part two to Eurydice, we also want to play new and bigger venues in new places.